Brief: This morning, Tuesday June 26th, we observed San Jose scale (SJS) damage to fruit beginning in untreated and infested ginger gold and delicious apple. SJS are presently in the white cap phase, a more vulnerable life stage then the black cap phase in which chitin has hardened and is less penetrable. Scouting blocks in which SJS fruit injury was observed last season is essential to confirm prior SJS applications were effective. 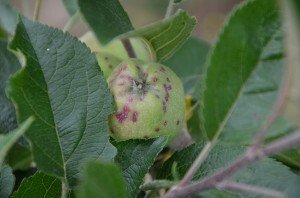 A red halo appears on fruit of infested trees within 7 days to 2-weeks after crawler emergence. We are presently at 1% infestation levels at the Hudson Valley Research Lab in in Highland, NY. If prior applications to infested trees have not yet been made this season, management is advised and should begin at your earliest application window. With the increased foliage in the canopy creating spray shadowing. It should be understood that coverage will be compromised even under ideal application conditions. * Movento SC (spirotetramat) plus a penetrant at 0.25% / 100gal. is required. Movento can still be applied along with a direct contact insecticide if high infestations are present to reduce the impact of spray shadowing with the use of contact insecticides. Introduction: San Jose scale has been in nearly every Hudson Valley orchard I’ve visited over the past ten years. Yet most growers have done well at keeping this insect from producing extensive losses since they have put the pest on their list to manage more closely. Management of this insect does require season long scheduling of directed applications to gain acceptable levels of control. We are approaching the emergence of SJS crawlers and precise timing of insecticide applications is critical to obtain control as the nymphs emerge. We have two to three generations of San Jose scale each year. The SJS overwinters as immature blackcaps; adults mature during the bloom period. Males emerge and mate near petal fall. First-generation crawlers is our concern this week and will begin appearing in early June in southern areas and continue for a month. These crawlers develop into mature adults by late July. Second-generation adults appear from late July to early September; and, if a third generation occurs, it appears in late October to early November. The life cycle is completed in about 37 days. Crawlers can usually be found from early June until a hard frost in the fall. 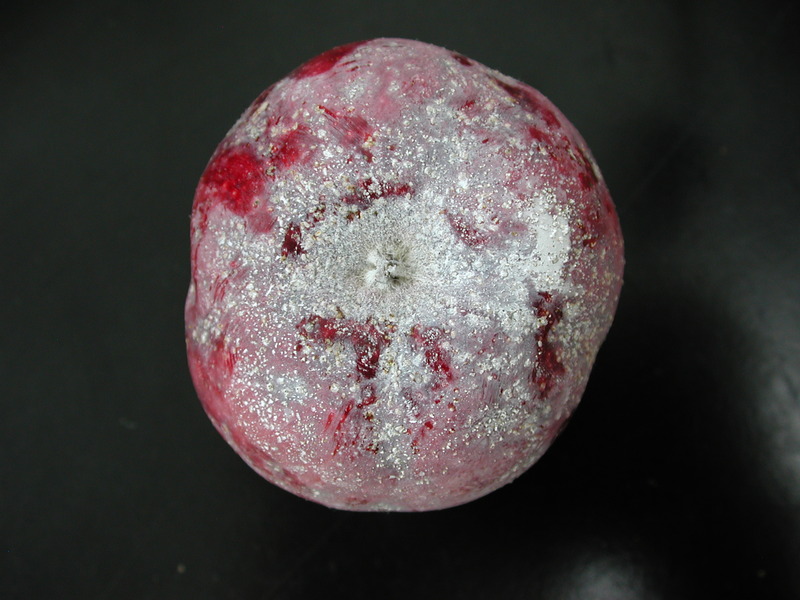 Management: San Jose scale (SJS) requires close monitoring during harvest to detect and isolate fruit damaged by early developing SJS populations. The use of pheromone traps to monitor male San Jose scale flights are placed in May and the use of double-sided sticky tape can be employed for monitoring crawlers in early to mid-June. 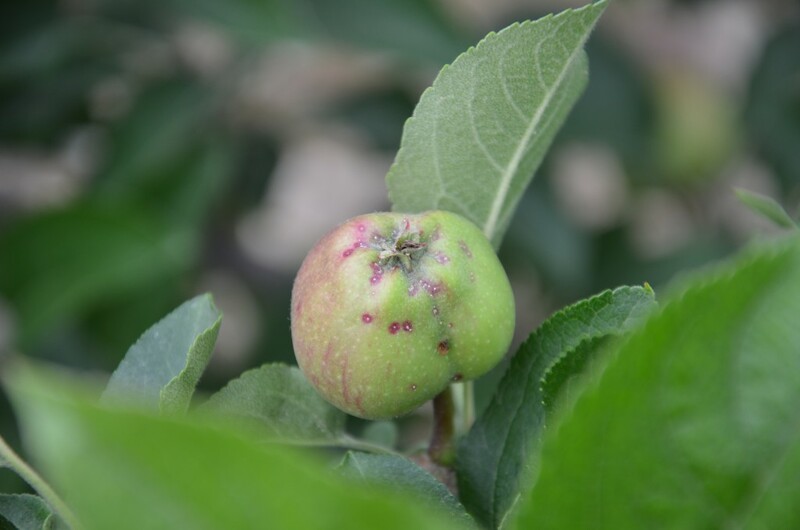 Any signs of 1st year damage should be followed diligently during the spring to address fruit injury from the previous year with applications of oil, precisely timed contact insecticides, insect growth regulators and or spriotetramat. SJS emergence with white cap development observed in mid-June. Depending on the mode of action of the material, applications of contact insecticides and insect growth regulators (IGR’s) will be made against the crawlers, effective when applied shortly after emergence using two back to back applications to cover the complete emergence of the insect..
Movento requires a two week window prior to emergence, and as such, will be increasingly ineffective for this early stage of emergence. However, If you’re trying to clean up a robust population, Movento PLUS OIL or a penetrant such as LI700 at a penetrating rate should be applied along with a contact insecticide to manage this early stage of emergence. The active ingredient in Movento, spirotetramat, is taken into the foliage, systemically moving through plant tissue to stems, roots, and leaves to be fed upon by emerging SJS nymphs during emergence and feeding. Our research has found the single application of 9 oz./A at PF or two applications at 6 oz./A at PF and 2C to effectively control the 1st generation of the insect. The OP Imidan 70WP and pyrethroids can also be used against the crawlers during emergence in back to back applications at 7-10 days. Assail 70WP (Class 4) is a broad-spectrum neonicotinoid that also most effective when directed against crawlers as they emerge. The use of 0.25% may increase efficacy. Centaur WDG ((buprofezin, IRAC Group 16) acts to inhibit the synthesis of chitin working as an insect growth regulator (IGR). Esteem 35WP (pyriproxifen, IRAC Group 7C), also an IGR, functions as a juvenile hormone mimic, inhibiting metamorphosis from one stage to another. 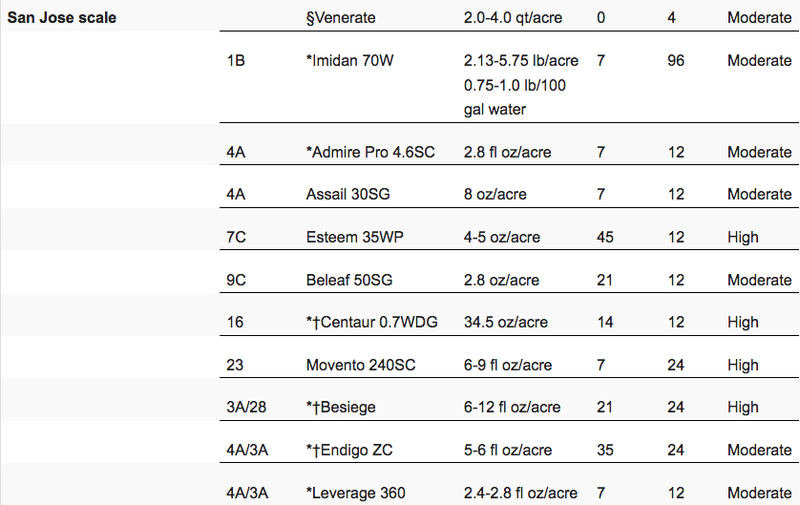 These insecticides are most effective when directed against adults during the pre-bloom early post bloom period. They can be used against crawlers at first appearance yet have no contact toxicity and tend to act slowly. The efficacy of these materials is improved by the addition of oil, however, Esteem 35WP, Centaur 0.7WDG and Assail can be used effectively without the use of oil. Besiege insecticide contains the active ingredients chlorantraniliprole and lambda-cyhalothrin It is a broad-spectrum foliar insecticide providing fast knockdown and long-lasting residual control of a wide range of insect pests, including lepidopteran, sucking, and chewing pests. Besiege® is a Restricted Use Pesticide. Venerate advanced bioinsecticides (Burkholderia spp. strain A396) feature multiple modes of action and are effective against a wide variety of chewing and sucking insects and mites yet are easy on beneficial insects. Venerate is OMRI approved for organic production. Remember, rotating classes of insecticides for each generation will delay the onset of resistance. Making multiple applications of the same class or same insecticide at a 7-10-day interval for the same generation is recommended. For organic tree fruit growers, oil is the best cure for SJS. Kaolin Clay, the active ingredient of Surround WP, has no efficacy against the emerging crawlers. Keep oil away from applications of sulfur used for disease management to avoid phytotoxicity to fruit and foliage. Surround WP Ineffective at Managing SJS. The Cornell fact sheet describes in depth San Jose Scale life cycle and biology.